Heart. Soul. Warmth. These are some of the words that could be used to describe what kind of quality most listeners look for in the atmosphere a great album. Apparently, Meshuggah absolutely despised those qualities of atmosphere when they created this monster. Seeking to replace the heart of their music with a mechanical mind, replace the soul with a void of ceaseless paranoia, and replace any warmth with a cold hate, they are one of those bands that alienates as many listeners as they enthrall. While this may seem like a recipe for disaster for most bands, Meshuggah manage to wrap this cold, unfeeling atmosphere with some brutally unrelenting grooves, and truly unique musicianship. 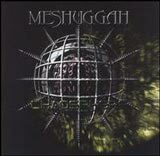 On Meshuggah's previous album, Destroy Erase Improve, the band showed how heavy their brand of extreme metal could get. On Chaosphere, the organic clean guitar parts found on DEI were completely done away with, and the riffs were given an extra shot of rhythmic complexity. Having said that, the first thing that strikes the listener upon hearing this album is the instrumentation. Heavily de-tuned guitars and bass, spitting in the face of melodic hooks, play riffs that are so tightly woven with Thomas Haake's intricate drumming patterns, will suddenly find themselves being underneath a very irregular and avante-guard style of soloing from lead guitarist, Fredrik Thordendal. While the songs tend to have a uniform tempo, they are not at breakneck speed, but definitely not plodding along sluggishly. It all comes together sounding as if it is one massive instrument designed for the sole purpose of churning out vitriolic sound. By the time the chorus in The Mouth Licking What You've Bled comes in, the listener is forced to bang their head and scream along with a passion that is unique to metalheads. Vocalist Jens Kidman completes the overall picture by screaming out his visions of a chaotic future that seems to eat away at whatever sanity his mind may still have left. The vocal delivery of Kidman is unique in the realm of extreme music, possessing neither the sub-sonic grunt of a typical death metal band, nor the straining shrieks found in many black metal bands. He has an intelligible mid range bark that makes him sound very angry, yet focused. The lyrics to the album were primarily written by Haake, and paint quite a grim picture of existence. Lyrically, New Millennium Cyanide Christ is particularly disturbing, yet still written in a way that contributes to the albums neurotic and insane feel. As much as this album has going for it, detractors certainly have a few points. Songs are so atonal and devoid of melody, they make Cannibal Corpse seem like Iron Maiden. Kidman's voice is suited well for how he uses it, but he just stays in one dimension the whole album, making it a little hard to swallow at first. It cannot be denied however, that these are some relentlessly heavy songs. After enough repeated listens, once the mind numbingly heavy breakdown in New Millennium Cyanide Christ at 3:22 is found, or the lurching verse of Neurotica finally clicks, other hidden grooves buried under the thick production and odd polyrhythms will make this purchase worthwhile. Note: Below is the video for "New Millennium Cyanide Christ". In time the video may become outdated and fail to play.